Famous for its lakes, Udaipur is one of the most beautiful cities of Rajasthan. The serene charming lakes offer you tranquility blended with the cherishing natural sceneries. Also called as the City of Dawn, this city possesses rich social, natural and cultural heritage, plush ecological surrounding and aesthetic beauty. Ramada Udaipur Resort and Spa is one of the best 4 star hotels in Udaipur. The property is lurking into the scenic beauty of lakes. Nestled near Rampura Circle in Udaipur, the resort features views of Lake Pichola and the Aravali ranges. Railway Station is 7 km from hotel, the Maharana Pratap Airport is 27 km and Bus stand is located in the close proximity. There are 72 rooms available in this property. ‘Myra Restaurant’ serves International cuisines. It is an ideal resort for business and leisure travellers. There is a spacious conference room for corporate travellers to organize weddings and other social events. Cambay Resort is another four star Udaipur hotels. It offers 60 rooms with all the modern conveniences. This resort has a spa, meeting rooms, spa, business rooms and a swimming pool. This hotel has an in-house multi-cuisine restaurant which serves Indian and International dishes. Tourist hotspots such s Sajjangarh Fort, Fateh Sagar Lake and Lake Pichola are in the proximity of 3 km from the resort. Golden Tulip is another hotel listed among 4 star Udaipur hotels. It is an ideal hotel for business and leisure travellers. This hotel is 2 km away from Fateh Sagar Lake and 500 m away from Saheliyon-ki-Bari garden. The hotel has 87 rooms which are categorized into Executive room, Superior room and Suite room. ‘SKY’ is a newly opened rooftop restaurant which serves Indian and International dishes. ‘Hola’ is a Spanish theme bar which serves Cocktails and Mocktails. This resort has a swimming pool, fitness centre, massage centre and a spa. The spacious halls in the hotel can room for both social gatherings and business events. Guests in the hotel can recreate through swimming pool, spa, fitness centre and many more. le roi udaipur, Hotel Amntra Comfort, Rajputana, Hotel Lake land are some other 4 star hotels in Udaipur. Among this Hotel Fateh Garh is a property that you would like to consider. 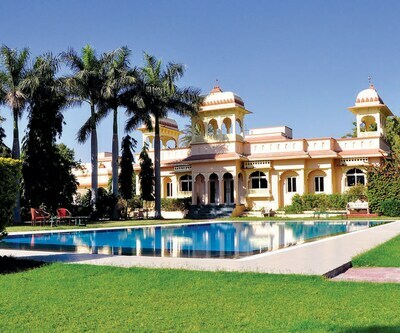 This is a luxurious four star heritage hotels in Udaipur lies atop the hills overlooking the Lake Pichola. This resort has 48 rooms and suites with all the modern amenities. ‘The Moksha Spa’ is equipped with Jacuzzi and steam. ‘The Baradari restaurant’ offers Indian and local cuisines. Tell me about radission udaipur hotel.? Radisson Udaipur provides comfortable hotel rooms and a prime location adjacent to Lake City Mall. After a restful sleep, you can take a swim in our pool, prepare for a meeting in our business centre or explore the area. Several popular attractions are less than five kilometres away, including the Jagdish Temple, the City Palace, Sahelion-Ki-Bari and Fateh Sagar Lake. For a small fee, we also offer transportation to Maharana Pratap Airport (UDR), which is about 20 kilometres away. What are the activities provided in the hotel justa rajputana like table tennis or pool table anything like that? Hotel has have badminton, cricket, football and some other indoor games but not table tennis/pool table. Is Mewargarh Udaipur has mini refrigerator available in the superior room? Yes Mini refrigerator is available in all of our room categories.